Are You A Yellow Vest? A combination of left and right ideology. Can you buy in? Not sure how the cap on tax, while at same time increased public funding for government services could work. Seems like a case of asking for everything. 1776 world wide is under way. I wonder how many 'down south' remembers just how much France helped them out (granted it was likely due to their own self-interests - ie., the enemy of my enemy is my friend...). Anyhow, we're all United Empire Loyalists here right? Those guys were traitors. The ultra rich should be taxed more than 25%. They don't spend what they have, just sit on their mountain of money and laugh while half the world starves. 25% for the middle class, or families earning $100k-$150k is reasonable. But tax rates should be higher for higher earners. I'm thinking 90% on yearly earnings over $2m though. There's absolutely no reason anybody needs to take home more than $2m/yr. Yeah and the social systems they want to fund will run on pixie dust I'm sure. Rofl 90% tax on high incomes. It actually used to be that high, crazy eh. In those days we were innovating and industry was booming. The 1% aren't going to give their money away. They have so much they could never spend enough to even put a dent in their mountain. I propose we rob them of it, and put it to use. The true yellow vest ideals are very socialist in nature. A direct push back to the essential handover of wealth and power to the corporate and wealthy elite in France while raising the costs of fees and services for the average person and reducing available social benefits and programs. Here in Canada every single yellow vest page I have been to, every site and every mention is populated by far right, anti immigrant angry white nationalist BS talking about the "corrupt Trudeau" without mentioning what he is guilty of doing. Talking about the opening of doors to immigrants but unable to say how when or why that is happening. Screaming about the UN compact and muslims and sharia law, yet unable to answer why non muslim immigrants make up 8 of our top 10 countries that immigrants come from. Ya no man. I can stand behind the yellow vest ideals of France. I can stand behind some of the ideals they have here in Canada that they are trying ti push as their agenda for all Canadians. But they don't in any way shape or form speak about or act like any of those ideals except anti immigration are important. When you make a movement about equality, and the levelling of the playing field for ALL Canadians but then essentially crap on any of them that look different, speak a different language or worship a different god than really you are doing nothing more than slapping on a vest over your khakis and polo shirt and crying about "protecting our identity"
And that is not something I can stand behind. 10 people in BC have more wealth than 1.3 million people combined in BC. The 25 point demand is interesting. So many that I'm not crazy about. But could I accept the package as a whole to bring a society together and send it in a new direction? I'm saying yes. Let's stick with the original gilets jaune agenda for the poll purposes. 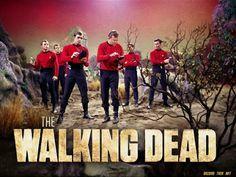 Maybe us common folk are more akin to Star Trek red shirts? There are some good ideas in there. We don't really need the 40% boost in all social programs in Canada but maybe targeted ones around things like seniors pharmacare. I also voted yes. I agree with many of the original points. What is being pursued by pop up groups in Canada though is being pushed back right wing groups and is essentially pro oil. Anti Trudeau. Anti immigrant. Keep our identity rhetoric. It's actually rather xenophobic and sad. So you're opposed to taxing the $&!# out of the ultra rich eh. You need to get your head examined as well as educate yourself in basic Macro/Micro economic principles if you think taxing the very rich 90% makes sense. But you are correct, I didn't take a single econ class. The 1% in Canada only make 220K annually. The top 10% only earn 80k annually. I always get a kick out of the stereotypes people put on these groups. The reality is the majority of these people are just your typical business owners, doctors, and engineers. And these people are not some evil group that is looking to screw over the lower income people, they are people that worked hard in life and sacrificed a lot to get were they are today. The supply they fill for this countries demands is what makes them wealthy. Canada needs doctors but why would anyone want to give up 8 years of their life in post secondary schooling (giving up a large chunk of their lives) to not get well compensated. The top 20% represent of Canadians already contribute to over 55% of all the tax revenue and one thing that gets missed a lot is that is that the top 1% represents more than 33% of all charitable donations. The reason a 90% tax wouldn't work long term is because people need incentive for growth and it might be sad, but wealth is incentive. Again why would someone waste so many years in schooling when after all is said and done they will only earn slightly more than someone who didn't go to school. If you were offered a promotion at work where you'd get a $2 per hour raise but would be required to work longer hours and have a bunch more added stress and responsibilities would you accept the promotion? It would be hard to justify, the trade off wouldn't really seem like it's worth it, now a $10 per hour raise might make it much more enticing. It's all about perspective, to you, you don't understand why someone needs to have all those nice things (cars, houses, first class plane tickets etc.) but that is the life style they have earned and their life style is expensive. That high end lifestyle also creates jobs and encourages innovation and efficiency. You probably don't realize but you (assuming you work) are currently in the top 1% amongst the world. To the rest of the world (their perspective), they don't understand why YOU need so much. The NHL is a prime example, it's the result of people having leisure expenses available. One thing a lot of people get stuck on is believing that equality is always such a good thing but it's not, especially when looking at equal outcome, trying to force everyone to end at the same finish line is a scary world that i'd want no part of.